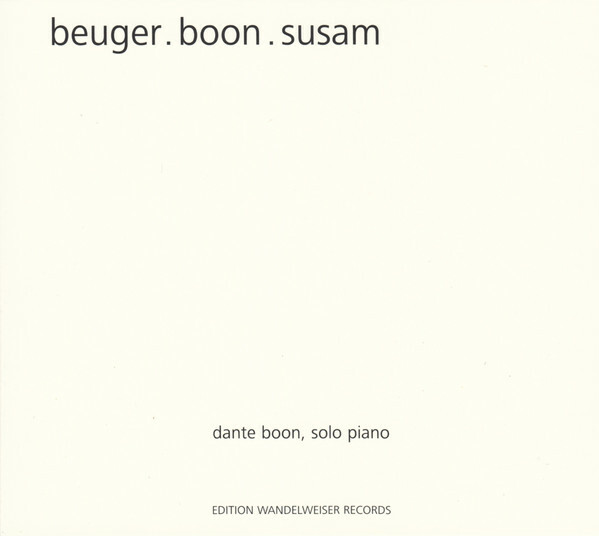 I've had the very good fortune, twice, to attend solo piano recitals by Dante Boon, once several years ago in Amsterdam and more recently in Brooklyn. Each occasion was and extremely special, highly rewarding event, Boon playing works from Wandelweiser composers, transforming the space into a ind of temple. After the Amsterdam concert, I wondered if ever two hours of music had contained so few notes, yet so much beauty. 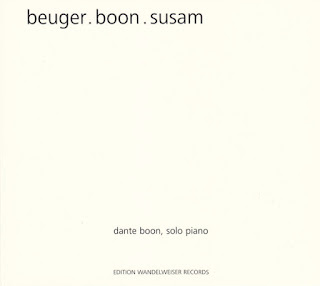 This recording is very similar to a Boon recital, consisting of a long work from Antoine Beuger, two shorter ones by Boon himself and a piece by Taylan Susam, each just so impressive, so thoughtful, so human. How to describe Beuger's 'pour être seul(e), sans réserve' (2009)? The softest of notes, high on the keyboard, individual, barely struck, more like caressed, open the work, isolated, glimmering. Some eight minutes in, simple chords, slightly bitter, more "aware", occur in sets of three, high-low-high, again hanging in small clusters, their beads reflecting something of the confusion of the earth below. It expands from there, shifting patterns, seemingly based purely on intuition rather than any system, always maintaining that ineffable delicacy that somehow remains grounded in the world. The music returns to single notes, eventually shading somewhat lower, slowly wafting to ground. Such deep, probing work, both in conception and execution. Boon's 'years, numbers' (2012) uses a set of four tones, structured A-B-B-A where one note is constant, while another is added (or not), the duration of each varied with immense subtlety throughout (and interrupted midway through by a sequence of two-chord patterns). The combination of simplicity and slight variation works wonderfully as do the pitch choices made, imparting a melancholic, perhaps nostalgic air, as if the composer is thinking of a past bittersweet event, playing it back in his head, subjecting it to different possibilities, ways things might have gone. The brief 'nov. (piano)' (2011) contains calm sets of chords, a gentle promenade, ambling downhill, very lovely. Susam's 'tombeau' (2014) begins with sets of four descending chords and, similar to the first Boon piece, retains the basic chord while augmenting the surrounding tones, then varies that a little, allowing the sounds to blossom like slow motion footage of a blooming flower, the pattern of petals offering regularity while the time sequence of their unfurling flows from regular to slightly less so. The basic downward trajectory is maintained for the most part, as befits a tombeau. Glints of other alternatives appear momentarily before the descent continues, no enhanced with lusher swaddling, some chords so lovely they cause one to shiver. A superb piece. And a superb album altogether, as rewarding as those recitals I've witnessed. I can't recommend this one highly enough. Marianne Schuppe - nosongs; a set of works for voice and lute (the latter enhanced with uber-bows) that dwell in the territory explored by Morton Feldman in his extraordinary composition, "Only". Toshi Ichiyanagi - sapporo; The 1963 piece performed here by eleven Seattle-area musicians (including our old buddy Robert J. Kirkpatrick) in 2010. Very quiet and filled with eerie, enchanting glissandi and rousing percussion. Sergio Merce - three dimensions of the spirit; Further delving into his microtonal saxophone as well as a prepared tenor, all of them probing and fascinating. Some of the most intriguing saxophonics I've heard in years.